What do you think of when someone mentions cooking in bulk? Hundreds of prettily-decorated fairy cakes, enormous dishes of tasty lasagne or a tray full of crusty loaves? And does the thought of having to prepare that quantity frighten you? There are plenty of good reasons for cooking in bulk. Take advantage of special offers - 3 for the price of 2, buy 1 get 1 free and so on. Larger quantities, especially of meat, are usually proportionally cheaper. It costs no more to have two casseroles in the oven than it does to have one. Coming home from work after a busy day you don't have the stress of preparing a complete meal for the family from scratch. You'll have the main course; you'll only need to add vegetables or salad. If you don't have the time or the inclination to do that but still like the idea of home-cooked ready-meals in the freezer, then each time you're preparing a meal that can be frozen, double the quantities and freeze half. What's Good to Cook for Freezing? Just some of the things you can freeze: casseroles, meatballs, lasagne, Bolognese sauce, chilli, stew, soups, pizza crust, cooked beans (if you're going to the bother of soaking and cooking beans, make sure you do at least twice as many as you need), curry, fish mousse, kedgeree, uncooked pies, cakes (don't spread sponge cakes with jam before freezing), scones, fruit cakes. 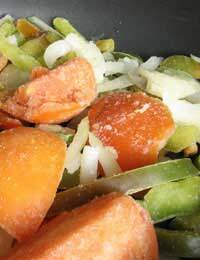 Some vegetables, such as onions or peppers can be prepared and frozen raw. Make sure any food you freeze is well-wrapped to prevent freezer burn that will take the taste out of the food. Cool the food quickly after cooking. Don't put warm food in the freezer. Don't overfill the freezer: air needs to be able to move around. Label all your containers with details of what's inside and the date of freezing. You might like to add re-heating instructions too. If you're a very organised person you'll want to keep a record of what's in the freezer and the eat-by dates, crossing meals off and adding new ones as you go along. Get together with a group of friends and swap dishes: most people have one dish that they're particularly good at. So if a friend compliments you on your chicken curry while you'd love to make a lasagne like she does, double up on cooking and swap. That way you'll have two meals but won't be bored! Give food away! Do you have an elderly neighbour, a sick parent, an exhausted friend? With a supply of meals in your freezer you can be the perfect neighbour/child/friend with very little effort! It really needn't take very much extra time and once you get into the habit of looking out for what's on offer and doubling up on your dishes, you'll wonder why you didn't bulk cook before! Many thanks for your response, that is extremely helpful even if a little complicated. I have printed this article and will pass it on to other family members. @ Iain beg McAndrew - I think Delia refers to a 'buttery kedgeree' which isn't suitable for freezing because it is too oily. I have included the link to one of our partner articles: Storing and Freezing Leftover Rice here. I hope this helps answer your question. You say that kedgeree is suitable for freezing, Delia says that it is not. As I am preparing a buffet for some 20 and wish to pre-prepare and freeze several dishes it would be helpful to know the definitive answer (if definitive is possible! ).